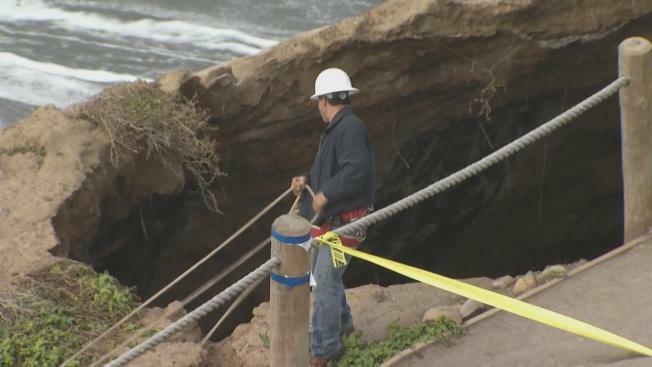 A dangerous sinkhole in Pacifica that emerged Saturday on a popular walking path just steps from a condemned apartment complex has prompted emergency repairs. OceanAire Apartment Homes, the entity responsible for fixing the damage, hopes to finish repair work in about one week's time. "We'll be adding some pumping, some sand and then, when it's safe, we'll go down and fix the pipes," OceanAire Apartment Homes spokesperson Nasser Elsalhi said. "Very expensive, but you've got to do what you've got to do." Pacifica's crumbling coastline has been under the spotlight in recent years because of recurring erosion due to heavy rains and high waves. In March, along Esplanade Avenue in Pacifica, an apartment complex was demolished after erosion along the cliffs made the area unsafe. The apartments were evacuated in January after geologists cited a "clear danger" with the continuous erosion there. The complex was yellow-tagged later that month, declaring the apartments uninhabitable. Pacifica city leaders declared a state of emergency. Prepping for any future disaster, crews representing the United States Coast Guard were also out in full force Monday to make sure that the landscape surrounding the sinkhole is safe, especially with inclement weather making a beeline for the Bay Area later this week. "We're here just to see what threats there may be so we know what's there so if there is a bigger event, and something goes in the water, we have an idea of what's already there, how much might be there, so we know better how to respond," Megan Mervar from the U.S. Coast Guard said. Mervar added that crews did not come across any potential chemical threats during a walkthrough. Although worried, residents in the coastal neighborhood are no strangers to the danger. "You can't fool mother nature," Fred Phillips said. During the repairs, a frequented look-out point at the top of a cliff along Esplande Avenue will remain closed. The latest sinkhole may have been caused by some of the biggest waves of the year, known as King Tides. Such tides are expected to peak Tuesday or Wednesday, according to weather reports.